In the Shadow of 10,000 Hills follows the intertwining stories of three women from vastly diverse cultures searching for personal peace in post-genocide Rwanda. Lillian Carlson, an African-American civil rights activist now in her early 50s, traveled to Africa from Atlanta in 1970 to grieve the assassination of Martin Luther King Jr. She dreamed of bettering the world, one child at a time, with an orphanage in Rwanda's rift valley. Three decades later, in New York City, Rachel Shepherd, a white bartender in her mid-30s, lost and looking for her purpose in life, embarks on a journey to find the father who abandoned her as a child during the 1994 Rwandan genocide. When Rachel travels to Rwanda, searching for her father, she finds Lillian and a young Rwandan woman with secrets that bind her to Rachel's father. Together, they all discover something unexpected: grace when there can be no forgiveness. Jennifer Haupt went to Rwanda as a journalist in 2006, a decade after the genocide that wiped out over a million people, to explore the connections between forgiveness and grief. She spent a month travelling in the 10,000 hills with a guide, interviewing genocide survivors and humanitarian aid workers, and came home to Seattle with something unexpected: the bones of a novel. Haupt has travelled to Africa five times, as well as Haiti, Lebanon, and other locations for business and pleasure. Her essays and articles have been published in O, The Oprah Magazine, The Rumpus, Psychology Today, Travel & Leisure, The Seattle Times, Spirituality & Health, and many other publications. 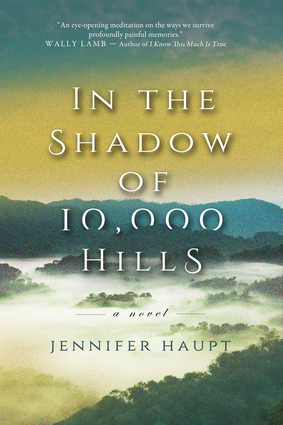 In the Shadow of 10,000 Hills is her first novel.